You can buy heavy locks and keys to protect your home from thieves. You can install CCTV cameras all around the house to protect your house from the unwanted elements. But all these measures are not enough to protect your home from pests. Pests are tiny creatures that can enter your home from any small cracks and crevices and every other minor opening which will be insignificant to you. The pests will be able to locate any smallest of the smallest openings and through that they will invade your home. And if you are wondering about how to protect your home from pests then here’s the post worth reading. Today in this post, I am going to share some of the simplest tips to protect your home from pests and bugs. There are some simple ways like keeping the windows closed, sealing the gaps in the window, keeping your house clean and tidy. But that’s not enough for keeping pests away from your home. Then what else is to be done to keep the pests away from home, you ask? Well that’s what we are going to discuss in this post. You can seal the entry points, use sprays, and try various home remedies to fight pests and bugs. But that’s not enough. If you seriously want to keep pests away, then you ought to try various things and here’s the list of most effective tips and techniques you can use to keep pests away from your home. Start inspecting your home, garden, for some pests and insects, like ant hills or termites. Look for the cracks and crevices and seal them properly. Mark the entry points in your house from where these tiny creatures can enter, like the gaps between the hinges and the windows. The pests never travel alone, if you see an insect, and then try to find the den of the other insects as well. Killing the insects as you see is not enough, you have to remove the pests as well as their nests. The eggs of the insects have to be removed too because the insects generally start breeding very fast once they find a suitable living condition. The insects can hide in various places like the walls, the floors, beneath the carpets etc. You have to find the hiding places of the pests. Like the humans, the insects also need food, water and warm temperature to breed. You have to make sure that they are not getting these. The bathroom and kitchen are often the first choice of the pests, before they try to relocate in another part of the house. Start cleaning these two places. Water logging, bad drainage systems, stored water ion open containers can breed mosquitoes which can lead to various fatal diseases like dengue and malaria. Make sure that water is not getting stored or accumulated near your house, be it the over flooded drains or on your rooftop or gardens. The outside garden or the outer perimeter of the house is the place from where the insects enter your house. So, to prevent pest infestation, you have to make the places free from pests. There are several chemicals available in the market, you can apply them in your house to get rid of pests. The insects start dwelling in that place where you do not clean properly or where there are thousands of things. The insects find a proper place to hide themselves and you house seem to the best place for that. Clean your whole house regularly, the insects hate clean areas. The carpet, sink filled with unwashed plates and dishes, unsealed food packets, open food containers attract the pests from all sides. Do not keep your windows open after sunset, as the light present in your room will attract the insects form the dark. If you have unused and unwanted boxes and bags, unused appliances and clothes, then remove them from your house. These untouched objects will be good hiding places for the insects. You can clean the whole house, mop the floors with warm water and add some vinegar and baking soda with it. These ingredients are hated by the pests. There are many floor cleaners and other cleaning solutions available in the market. You can use them too. Make proper use of the vacuum cleaners. The vacuum cleaner will remove the dust particles from your house, like the sofa covers, the carpets and rugs, and thus you can avoid the presence of dust mites. The carpets and rugs are often left unclean because it is difficult to see the dust on them. You might think that they are clean, but they are not. The food particles, food crumbs, dust are present which can lead the insects. Clean the water tank, drainage pipes at least twice a month, as dirty and clogged drainage system can cause the entry of dangerous pests like rats. Install screens on your doors and windows. This way, you can let the fresh air and light in, but you can also keep the pests out of your home. De-clutter your home. The less the clutter, the less is the hiding place of the insects, and the lesser the chance of pest infestation. Citronella leaves and candles can keep many insects like mosquitoes and flies away from your home. They cannot tolerate the strong odor of citronella. Grow some plants near your house like tulsi, neem, marigold, mint. The pungent odor of the plants can repel the pests and insects. If you have any scrap woods, or any scrap furniture in your garden or roof, then remove them immediately as these are one of the favourite places of the insects. If you have any leaking pipes or faucets, then fix them now. Stagnant water can attract a lot of pests in your home. The garden must be clean and tidy. Remove the unwanted weeds and bushes from the garden so that the insects cannot make their dens there. Keep food leftovers in closed air tight containers. The ants, flies and cockroaches can smell the foods from miles, and they can start living in your home. The trash can or the dust bin must be covered with a lid all the time. 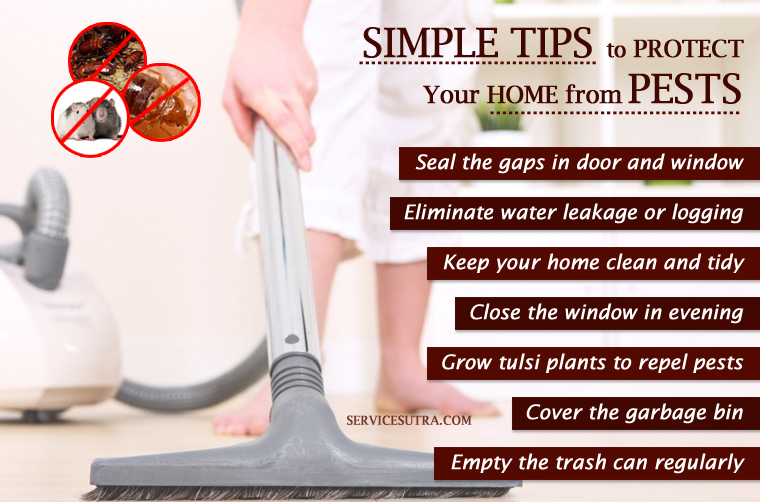 Empty the trash can regularly, so that the pests and insects cannot find any opportunity to start dwelling there. Boric acid can kill and remove most of the insects in general. For killing ants, pour kerosene oil on the ant hills and molds, they will die instantly. To kill the cockroaches, pour soapy water on them, they will die within minutes due to suffocation. For rats and rodents, you can place the rat traps. The pests like termites and bed bugs can spread very fast, so you have to be extra careful. Beat the carpet under the sun frequently to remove the dust mites. Wash the bed covers, cushion covers; sofa covers weekly so that the pests cannot stay for long. Do not keep the keep the unwashed plates and dishes overnight. The pests can get a chance to feast on them. They can cause severe infections and other fatal diseases. Boil cinnamon and cloves in water, and let the smell spread in the whole house. The pests cannot tolerate any strong pungent odor. For keeping the lizards at bay, keep some egg shells in the corner of your room. The lizards hate the pungent odor of the eggs. You can hire the professional pest exterminators to inspect your home. This way, if they find the least sign of pest infestation they can treat it as fast as possible. The pest exterminators are experts and they know all the hiding places of the insects. They have the chemicals and eco-friendly pesticides with them, so that the home environment is safe. To prevent the pest infestation at your home, you can book pest controllers. You can also hire on a contract basis, that is, they will come quarterly or half yearly and inspect your home for the presence of any pests at your home. Do not forget to clean the insignificant places of your home too, like the store room, the garage, the basement etc. These places have many items, where the pests can hide. Whenever you are cleaning the home, use warm water. The warm water can kill the germs and also prevent the pests from coming to your home. Check your luggage well after coming home, as they can contain pests with them like bed bugs and termites. Open your shoes near the door do not walk around the home by wearing the shoes which you wear outside. This simple habit can help you prevent the entry of many germs and pests to your home. It’s always a good idea to get professional pest control done every quarter or at least once in every six months. But that does not mean, you can’t fight it on your own. The pest infestation can happen in any season of the year, but in summer and monsoon, the chances of infestation increases. During monsoon, the pests do not find any place to survive as there is water everywhere. So, they tend to come to your house to find free food and shelter. And if you have indoor plants, then chances of pest infestation may increase. During monsoon, keep the plants outside of your home as they attract many insects and pests. A clean and clutter free home can help you prevent pest infestation. We have already discussed some of the simplest ways to keep pests away and I hope you will use some of these tricks to drive pest away. Try these techniques and feel free to share your experiences by commenting below.